One of my grade 7 students recently did a speech about why people should care more about sleep. I invited the seniors in to listen so she would have an audience. As she spoke I watched the senior kids eyes light up when she talked about the overuse of technology. Their teacher and myself could even relate to what she was talking about. Sleep for me came easy as a young person. My mother would say I got enough for a lifetime back then. It wasn’t until I hit my 40’s that some challenges presented. My mind was racing at bedtime with all that I had to do. It didn’t exactly help the wind down routine. Luckily I grew up in a house with only a bath. When I got my own place the bath continued to be part of my evening ritual. I would lie in my old claw foot tub and just relax the day away. Then I would get into my pajamas and make my way to bed. Last year I moved to a house where I share a bathroom with 3 boys. It is now a chore to keep the bathtub clean, thus the bath time ritual has gone by the wayside. Almost 50 now, I have recently started thinking and learning more about the importance of sleep. Arianna Huffington’s Thrive Global has some great articles on the topic. I also got a fit bit last year that tracks my sleep. Now I see daily how much sleep I’m not getting. It’s depressing and I feel like a sleep failure. There have been weeks where I made a conscious effort to go to sleep earlier and wow did I notice a difference. I physically felt better. From this I discovered lack of sleep has an impact on me. It was something I never had to think about before but now it is a real thing. I can remember days when I could have fallen asleep at the wheel while driving home on the highway. At least I don’t have that feeling any more. Now the routine is watch house hunters international and look at Pinterest on my phone, pop a melatonin on occasion to get on track and try to go to sleep. The gym helps me to feel more tired. Some nights it works and other nights it’ss like I’m laying there watching the ceiling. I’m told it could be hormonal as I broach the premenopausal years, but the bottom line is I am averaging about 6-7 hrs a night. My ultimate goal is 8hrs but that only happens on the rare occasion. If I hit 7 I give myself a pat on the back. The best advice someone gave me before is don’t fight it. If you can’t sleep don’t get worked up about it. Rather, move on to something else and you will eventually get tired. This approach has worked for me. I appreciate sleep when I get it, and when I don’t, I tell myself it can only get better. I guess my sleep role model is Arianna Huffington. I could relate to her story of being a busy woman and finally reaching that point of exhaustion. There is a fine line between lacking sleep and feeling exhausted. I now try to manage my life as best I can so that I don’t get to that point of zombie. 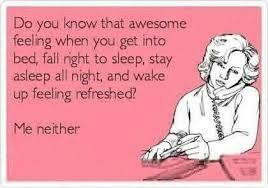 Sleep seems to be an ongoing battle for me and many others my age. Perhaps the best advice came from my 12 year old student today. “Sleep is one of those little things that can make or change something in a big way. Sleep is very crucial…Sleep is something everyone needs…sleep is almost as important as eating…sleep is essential to a healthy lifestyle.” After listening to her speech, I told her I just feel like going home to have a nap. An important message straight out of the mouths’ of babes.